Metallica has long been one of the greatest forces in rock and roll. 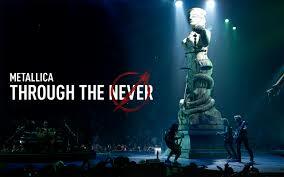 And that power has been perfectly captured in their new film, “Metallica Through the Never.” The movie takes what would have stood as a terrific, stand-alone concert film, and adds a subplot where a roadie is sent on an important mission to retreive something vital to the band. Played by Chronicle’s troubled telekinetic teen, Dane DeHaan, the roadie, Trip, must make his way through a series of dangerous obstacles as he travels through what is increasingly becoming an apocalyptic landscape. All the while, the band plays on, with classics like “For Whom the Bell Tolls”, “One” and “Master of Puppets”. Be aware, the movie really is a concert film, with the accompanying story cropping up here and there. But the two are masterly interwoven together by director Nimrod Antal (“Predators”, “Vacancy”.) The band (James Hetfield, Kirk Hammett, Lars Ulrich and Robert Trujillo) sound absolutely amazing, especially in ear-crunching IMAX audio. It’s the next best thing to hearing them live in concert. Also welcome is that the film is expertly edited by two-time Oscar winner Joe Hutshing (Born On the Fourth of July, and one of the best edited movies ever, JFK). No annoying, vertigo-inducing, MTV-quick cuts here. Everything plays out so you can actually enjoy it. Horror is on display throughout the movie as well, from gruesome images of people hanging in the streets to Trip facing off against an axe-wielding, gas mask-wearing, horse-riding harbinger of death. Backed by New York Yankee Mariano Rivera’s closing tune, “Enter Sandman”, Trip must muster all he can if he’s to complete his mission. Fans of Metallica will surely be satisfied hearing their favorite songs in all their bone-crunching splendor, right down to the last note during the last frame of the film. And seeing how a compelling plot was worked into the musical framework of the film leads one to wish other rock stalwards might try a similar approach. Ozzy Osbourne could be one. Alice Cooper already does it during his stage shows. As does Rob Zombie, and as a horror writer/director himself, surely he could come up with something loud and terrifying. Although not in the horror genre, an underrated, yet excellent rock and roll/journey film is Detroit Rock City. Directed by Adam Rifkin, associate produced by Tim Sullivan, and featuring Kiss themselves, the movie has one of the best soundtracks you will ever hear. 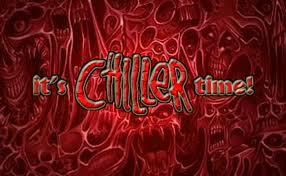 Definately worth checking out. One final note about Metallica Through the Never – some of it was filmed in Newark, NJ. That makes it the second post-apocalyptic movie this year, along with World War Z, which is early on set in Newark, though not actually filmed there.